In a case where immigration law and labor law intersected, Pacific Steel Casting Company (Pacific Steel) reached a settlement with the National Labor Relations Board (NLRB) concerning its obligations to bargain with the union about its implementation of E-Verify. On February 23, 2011, Pacific Steel enrolled in E-Verify by signing a Memorandum of Understanding (MOU) with the Department of Homeland Security (DHS). However, in so doing, it did not notify the Glass, Molders, Pottery, Plastics & Allied Workers International Union, Local No. 164B (Local 164B), which represented its 600 employees at its Berkley, California facility. At approximately the same time, Immigration & Customs Enforcement (ICE) served a Notice of Inspection on Pacific Steel. As a result of the I-9 audit, ICE concluded about 200 employees did not have valid work authorizations; thus, Pacific Steel terminated these 200 employees in December 2011. In May 2011, Local 164B made an information request to Pacific Steel asking whether it had enrolled in E-Verify . As the bargaining representative, it is entitled to request certain information which could impact the employees’ terms and conditions of employment. 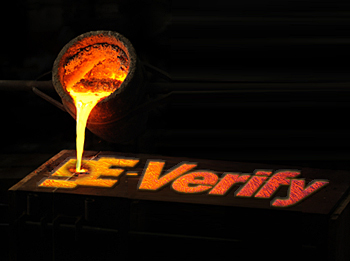 Pacific Steel confirmed its participation in E-Verify but initially claimed it was required to do so because Pacific Steel was a federal contractor. Later, Pacific Steel conceded it was not a federal contractor but planned to continue using E-Verify. Thereafter, Local 164B filed a charge with the NLRB alleging Pacific Steel violated Section 8(a)(5) of the National Labor Relations Act by unilaterally implementing E-Verify without bargaining Local 164B. In the March 2012 settlement, Pacific Steel agreed to provide written notice to the DHS terminating their enrollment in E-Verify. Furthermore, it agreed to reinstate employees, with backpay, who were terminated as a result of implementation of E-Verify. However, this does not appear to cover the 200 employees terminated in 2011 as those were as a result of the ICE audit of current employees while implementation of E-Verify covered new employees hired after February 23, 2012. Also, if it is determined these employees did not possess proper work authorization, the employees could not reinstated under NLRB law or awarded backpay. See Mezonos Maven Bakery, 357 NLRB No. 147 (Aug. 9, 2011) citing the Supreme Court decision, Hoffman Plastic Compounds, Inc. v. NLRB, 535 U.S. 137 (2002) – “awarding backpay to undocumented workers lies beyond the scope of [the Board’s] remedial authority”. As one of the few immigration compliance attorneys who formerly worked as an attorney with the NLRB, I can tell you if Pacific Steel had in fact been a federal contractor and required to enroll in FAR E-Verify, this matter probably would have had a different result. Also, if Pacific Steel had offered to bargain with the union before implementation of E-Verify and reached an agreement to sign a MOU, it could have lawfully implemented E-Verify. This is a reminder of how employers face obligations under multiple statutes in matters involving immigration compliance. Bruce E. Buchanan is the partner-in-charge of Immigration Practice at King & Ballow, Nashville, Tennessee. Mr. Buchanan represents employers in immigration, labor, and employment law, as well as individuals in immigration law. He graduated from Vanderbilt University School of Law in 1982. Mr. Buchanan authors a blog, at www.kbimmigration.com/webline, which covers immigration compliance issues. He is the Chair of TBA's Immigration Law Section as well as editor of Immigration Law Section Newsletter, and Employment Law Comment. He may be reached at bbuchanan@kingballow.com.